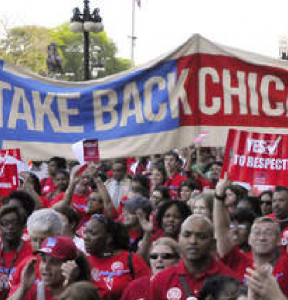 “We refuse to throw our student’s needs under the bus in exchange for raises,” say CTU members, as strike moves into third day and management continues to refuse to use a portion of $36 million in hoarded education dollars to secure student supports. CHICAGO—CTU educators at four CICS schools will strike for a third day, with management dug in on exchanging wage parity with CPS educators for higher caseloads for counselors and social workers, larger class sizes with no enforcement language, and no written guarantee not to cut student services or resources. Management wants to increase the student-to-counselor/social worker ratio, which is already well over nationally recommended ratios, giving management the wiggle room to lay off some frontline staff. CICS still refuses to dip into $36 million in public education funds it has siphoned out of classrooms. Up to 30% of the public funds CICS receives are deflected into inflated management fees, redundant bureaucracies and ‘reserves’. CTU strikers will hold a press conference at 6AM Thursday at the picket line at Wrightwood, located at 8130 S. California. On Wednesday, CICS sent at least eight corporate staff to bust legal picket lines at Wrightwood and Ellison, including Chief of Strategy & Portfolio Christine Leung, who earns $140,000/year, Director of Network Policy Yesica Rufino-Perez, who earns $100,000/year, and Chief of Network Services Kathleen Clark, who earns more than $140,000/year. One CICS corporate employee incited police to threaten to arrest all strikers if even one spoke to parents. “Those are really pricey union busters,” said Northtown teacher Jen Conant, who heads up the CTU bargaining team. Management has told parents that children will be punished for unexcused absences (false) and that school was open for instruction (even though ‘instructors’ are on the picket line, not in school teaching) to try to get children across the picket lines. CICS also for the first time posted security staff at Wrightwood, beginning on the first day of the strike. “That’s an awful use of public education dollars that could instead be used to settle the strike and preserve student services,” said Conant. At 1PM, CTU strikers and allies will join elected officials and community allies at the offices of INCS—the Illinois Network of Charter Schools— at 150 N. Michigan, to announce plans to demand a state investigation into a number of shady CICS investment and bond deals marred by insider dealing and conflict of interest. One of those deals includes an investment of over $19 million with the company of CICS co-founder Craig Henderson, who also served as CICS president and treasurer. A second insider deal involved a bond sale handled by an investment firm, while the wife of a firm partner was serving on CICS’ board. INCS, which is the most prominent charter operator lobby in the state, has avidly supported CICS against striking educators. Pickets will be up at all four striking schools—Northtown, Wrightwood, ChicagoQuest and Ellison—early Thursday morning. The CTU has been bargaining with CICS for a new contract since last spring, around demands for living wages for low-wage paraprofessionals who are the backbone of their school communities, yet can earn as little as $30,000 per year, even with masters degrees. 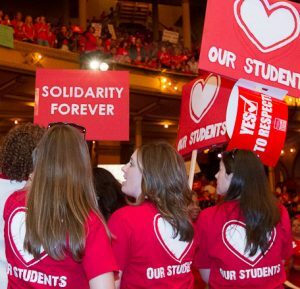 The CTU is also fighting to lower class sizes and increase support for student needs—including adequate staffing of special education teachers and aides, and no increase in caseloads for counselors and social workers. CICS has more than doubled the number of non-educational corporate positions from 22 in 2017 to 48 today, and the number of six-figure executives has exploded from four in 2017 to 14 today. CICS CEO Elizabeth Shaw, who oversees CICS’ 14 school fiefdom, earns nearly as much as the CEO of CPS, who oversees close to 600 schools. Low wages and poor working conditions drive huge turnover at CICS schools. Conant was among a cohort of more than a dozen new Northtown teachers when she began teaching at the school in 2012. Only three, including Conant, remain at Northtown today.